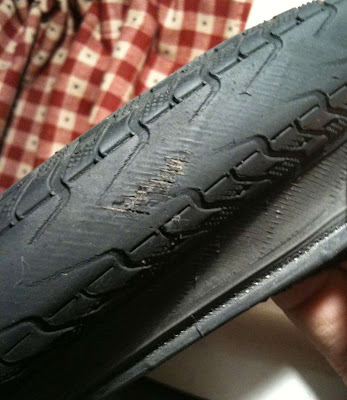 Being someone who rides a bike like most people drive cars (but way harder), a good tire is more than a little important. A tire needs to roll fast, wear long, grip in any weather, and resist assaults from all manner of roadside detritus. Some years ago I find the Panaracer T-Serv (28mm), and have been riding them ever since. This week I wore my third Panaracer T-Serv PT in a row all the way down to the threads with a grand total of two punctures over the life of all three tires. That's less than 1 puncture per tire lifetime. I don't know how many thousands of miles that is between punctures, but whatever the number is, it's a lot... Panaracer, your messenger tires rock. Please send me free ones. I've had pretty good luck with Conti Ultra Gatorskins (I ride them in 25mm on both my road bike and my fixie). Have you ridden those? Any opinions one way or the other? Good advice, thanks K. I will try Panaracer's tire once my current tire is spent. Much to my own surprise, Bontrager's Race X Lite, which came with my Lemond, hold the record so far in my books (5,000km). I have used both Schwalbe (Stelvio) and Conti (Ultra Sport) with somewhat disappointing results, though I like Schwalbe's MTB tires. Right now I am trying Kenda's Kriterium, for they were the cheapest I could find at my LBS and looked most durable. The rear tire has survived 700km so far but already looks a bit like a Swiss cheese; it is hard to believe but the roads here in Auckland are worse than in Boston. @xsdg: I've never personally rode the Gatorskins but a friend of mine has been using them on his daily driver (~20mi/day) and has had numerous punctures in recent history. Wrench: what size gatorskins is your friend riding? That said, I'll undoubtedly end up trying the Panaracers given that they're about half the price of the gatorskins. @xsdg: He's riding 28's. They predate the new "hardshell" model so I suspect they are the same as the current normal version. He says he uses about 80psi and all the flats have been due to glass. Relatedly, even closer forensics of the Panaracers showed that many of the cuts had rounded pieces of glass in them, as if the sharp piece that originally cut the rubber got stuck in the hole but was ground into oblivion before it got through the casing.